When a business has decided to optimise their warehouse management/operations, it gives rise to a number of complex questions. What do you want to achieve? What choices are available? When is the project considered successful? Identifying what you want to achieve and why is the key to success. Another important point to remember is that all companies need to be humble in the digitalisation of their warehouse system as it is a complex project that is costly at the start. It must therefore be planned out down to the smallest detail. 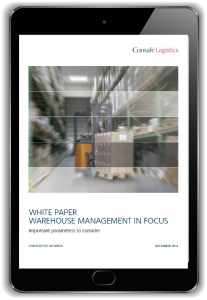 This document is intended to visualise the challenges and thereby facilitate the decision-making process and the upcoming journey of change in the warehouse. Fill in the form and recieve your copy of the whitepaper.